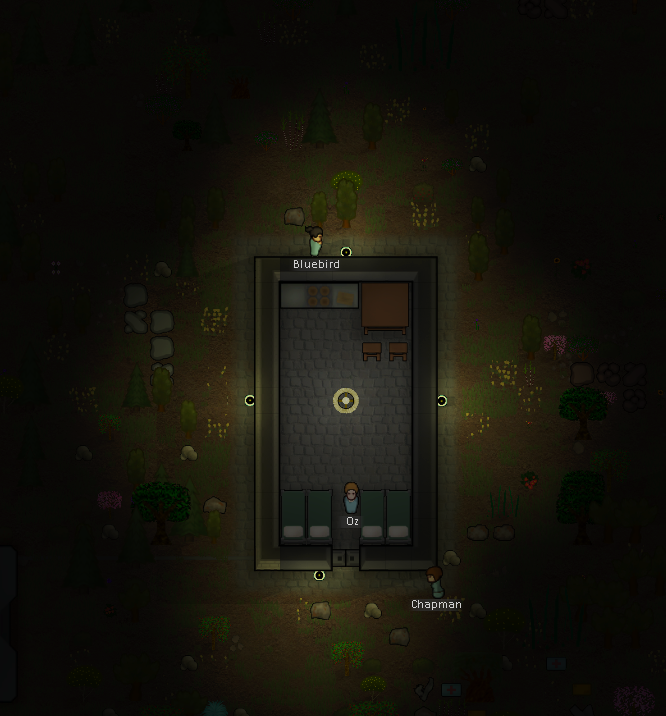 This mod adds several new lamps and research to the game. Illumination: It's complicated, but it lights up 8 squares from the lamp with brightly lit and significantly further for just lit. Illumination: Same as standard sunlamp for brightly lit, slightly lower for just lit. notification at all if you don't feel like giving it to me. I'm just putting it out there for fun. Loki88 For helping me squash a bug and for updating to alpha 11 while I was busy with real life. 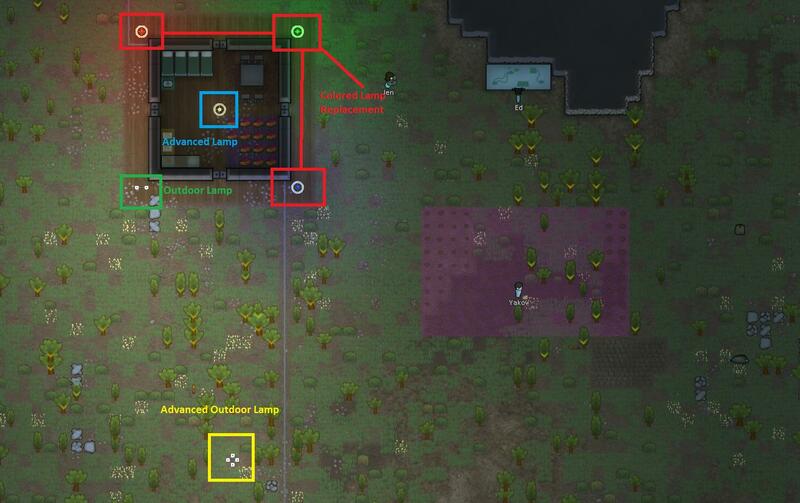 V1.0 - V3.0: Added in advanced lamps and research for them. Changed the textures for colored lamps. Added beauty to the colored lamps. Added outdoor lighting in two tiers of research. V4.0: Added in advanced sunlamps with a new research topic for it. V4.2: Added in wall lamps. V5.0: Added in UV Heat Lamps. Edited Advanced Sunlamp so that it can be used outside for whatever reason you might want it outdoors. Added research requirement (Advanced Lighting) to wall lamps. Made some small tweaks here and there that most people won't notice. V5.1: Nothing new added, just updated for Alpha 9. V6.0: Added a low tier outdoor porch lamp. Looks best when placed against a wall. V6.1: Updated for Alpha 10. V6.2: Updated for Alpha 11 by Loki88. amature programer with a god-complex. i won't have a god complex,everyone else has a mortal complex. which lines are 1 pixel off? You mean the space between the lamp shade and the wooden base for the lamp? I did that so you could see the ground under the lamp but it seems it's not a wide enough gap to see the floor well enough to know that. I will work on improving that in my next version of the texture. I'm still learning how to use the software for making the textures so it should look better and better as I go. Thanks for the feedback. which lines are 1 pixel off? I think your lamp is too bright, not the light on the surface, but the lamp itself looks not immersed into the environment. Ah, yeah that annoyed me when I was making it too. But the pictures are 64x64 pixels so it's unavoidable. I think I understand you here. I need more shading on it. I'll put that on the list of things to learn how to do and then I'll make that change. Thanks for the feedback. [edit to add] it seems shading is a lot more complicated than I was expecting. I'm going to have to learn more than just which tools to use in the editor. I'm going to have to learn the appropriate places that should be highlighted and which ones should be shaded. This won't be in my next version, but I'll work on making it fit in to the world a little better using other methods and see where it gets me. I just finished my 2nd version of the lamp. I'm still not quite happy with the shade, but the base looks better in my opinion. The new version is just attached to the original post and you can just replace the one in the mod folder with it. Don't forget to change the file name to LampStanding.png if you do choose to use this one. For the time being I'll just attach the new textures to the original post until I make a version that is improved enough to warrant a new version for the mod. If the first two lamps don't impress you then just keep checking back. I'll be working on this till I get it right. Just updated to V2. Now includes colored lamps. Each lamp adds beauty now and costs slightly more than in vanilla. The colored lamps add even more beauty than the white lamps so now it's actually worth researching that. I may add more colors later if I get around to it. If there is enough demand for it I will make another mod that doesn't replace the vanilla lamps but adds these in to the list. And yet another update today. Went ahead and added research topics and more lights. Leaving the vanilla lamps in. Now you have to do some research to get the prettier lamps. The original post has been updated with the new details. And yet another update today. Thanks. Yeah, I just learned how to use GIMP photo editing software yesterday and I'm finding it is a load of fun to play around with. I have more projects in mind already that will probably be worked on soon. I think I'm done adding to this mod for the time being and will only be updating to tweak the stats of the objects once I start getting feedback on that aspect. I do have further plans to add onto this mod in the future but for now I'm going to focus on making new melee weapons maybe and possibly some medieval armor things. If the armor textures are good enough, I hope to send them to Shinzy to be included in apparello. I still haven't discussed this with him of course, I'm just thinking as I type. I'm open to suggestions for texture changes on anything else that might bug you if you have any. I thought about doing more floor types as well but that's already been taken care of by someone else. GIMP is the best! Much like this mod! I'm going to focus on making new melee weapons maybe and possibly some medieval armor things. I'm really glad to see something that adds in outdoor lights! It's annoying that even the growing lamps have issues in the rain, so my colonies always end up so gloomy looking at night. Could we please get a list or table of the different lights and their construction/power cost?